At Easter it is a tradition for us to bake an Easter Lamb, and of course I continue this tradition when living on my own now 🙂 This year I decided to make a sponge cake lamb! It is actually quite easy and the result is just great; a fluffy light sponge. But you are free to bake any normal simple cake mixture you want! Normally I decorate my lamb just with Icing Sugar or brush it with heated jam and sprinkle some coconut flakes onto it. But this year I went for a different approach… but you can see by yourself 🙂 It may look like it would be much work, but it really isn’t! I made a simple buttercream icing and then covered the lamb with small rosettes using a piping bag. 1. I started by mixing 3 eggs with 60g of caster sugar and a packet of vanilla sugar until very creamy and fluffy. I also added some lemon flavoring to the mixture, but feel free to add orange or vanilla extract just as you wish (the cake will taste great without flavorings as well). 3. Assemble the lamb baking pan and butter it so the lamb will not stick to it. Pour the batter into the form and let it bake for 40 minutes at 180°C. Let it rest in the form for 5 minutes before transferring it onto a wire to cool completely. 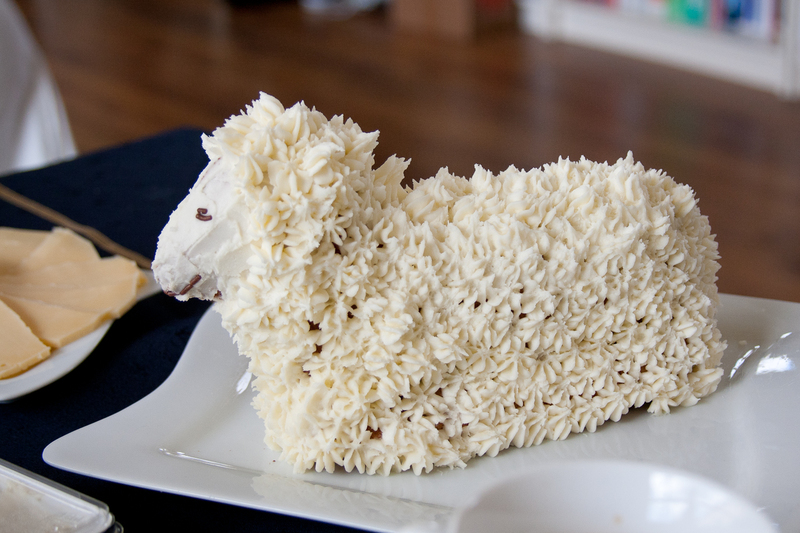 My Easter Lamb was featured at the Sugar and Slice Link Party. Thanks a lot Lisa!